If you’re the kind of greenie that likes to burn rubber, but feels guilty about the gas you’d be wasting, the Spanish industrial design firm, Applus Idiada, has something for you. Enter the Volar-e. The Volar-e is the car for those of us who have wondered what a 1,000 horsepower EV looks like. It’s the car for those of us who think the Tesla Model S Performance is too slow. In a word, it’s downright silly. 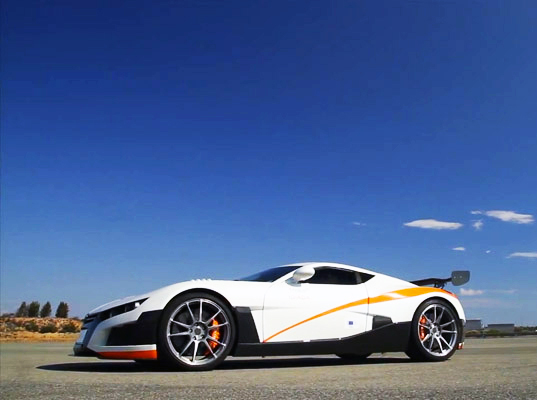 Four electric motors propel the Volar-e to 62 mph in just 3.4 seconds. With a governed top speed of 186 mph, it blows the doors off of most cars on the road. It packs a 10-cell lithium-ion battery pack rated at 38-kWh, which can be replenished in 15-20 minutes with fast charging. Plus it’s got a sweet ginormous spoiler. All of the ridiculous performance metrics aside, perhaps the most interesting factoid about the Volar-e is that the European Commission funded 50% of the project. The car was exhibited at the Circuit de Catalunya near Barcelona on Thursday to promote the viability of electric vehicles. If only they all looked and drove like this one. 2 Comments on "Video: 1000 Horsepower Volar-e – The Bugatti Veyron for Tree Huggers"
LOL … at 1:25 in the video, the front right tire is going up in smoke. Either they wanted to do that, or they don’t have all the traction-control kinks worked out just yet. I think you’re on to something Open-Mind. There’s no telling what fun The Stig might have in a 1,000 HP car that sounds like a washing machine spin cycle.